This diary recounts the experiences and impressions of Captain Alfred Austell Cunningham, the first Marine aviator, during his tour of British and French aviation facilities in November and December 1917. The document reveals much about the character and personality of a notable Marine and gives a view of wartime England and France as seen through his eyes. Dr. Graham A. Cosmas, the editor, joined the staff of the Division of History and Museums in December 1973 after teaching history at the University of Texas and the University of Guam. He has a Ph.D. in History from the University of Texas and has published several articles en United States military history, as well as a book on the U. S. Army in the Spanish-American War. The Cunningham diary, is presented here by itself as a preview of a larger collection of Cunningham materials from World War I which will be edited by Dr. Cosmas and published next year by the History and Museums Division. 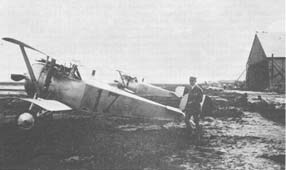 During November and December 1917, Captain Alfred A. Cunningham, the first Marine Corps aviator, travelling under orders from Major General Commandant George Barnett, toured the battlefronts and flying fields of France to observe Allied air operations and training. 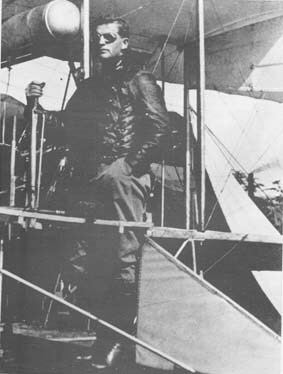 In 1917, Cunningham was the Marine Corps's de facto director of aviation. He had joined the Corps in 1909 and as a first lieutenant stationed at the Philadelphia Navy Yard made his first experimental flights in a crude airplane which he rented at his own expense. In May 1912, the Marine Corps sent Cunningham to Annapolis for Navy pilot training. He soloed early in August of that same year and on 5 March 1913 was designated a naval aviator. During the next four years, as Marine aviation slowly grew, Cunningham, joined by a few other far-sighted Marines, continually worked and argued to promote its interests. 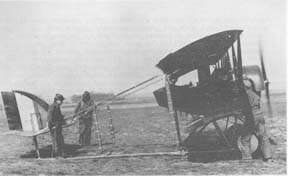 On 26 February 1917, Cunningham received orders to organize at the Philadelphia Navy Yard the Marines' first tactical aviation unit, called initially the Marine Corps Aeronautic Company. At this time, Marine aviation muster rolls carried the names of seven aviators and 43 ground personnel. With the declaration of war against Germany in April 1917, Marine aviation, with Aeronautic Company as its nucleus, joined the rest of the Corps in rapid expansion. Cunningham began looking for a way to get his force of men and machines into front-line combat. To this end, he made his trip to France. He brought back from his tour a proposal for the creation of a Northern Bombing Group composed of squadrons of Navy and Marine land planes with the mission of attacking German U-boat bases on the Belgian coast. This plan won the backing of the General Board of the Navy, and on 11 March 1918 Cunningham received instructions to organize the First Marine Aviation Force -- the first Marine air organization ever to fly in combat. During his tour of the war front in 1917, Captain Cunningham kept this diary, which was acquired by the Manuscript Collection of the Marine Corps Museum in November 1973 as part of a gift of Cunningham materials made by Mrs. Alexander H. Jefferies, sister-in-law of the late Mrs. Alfred A. Cunningham. The original of the diary is now located in the Alfred A. Cunningham Papers (PC 459) in the Marine Corps Museum Collections Unit, Building 198, Washington Navy Yard. The diary, kept in tiny, neat handwriting in a small pocket notebook, begins on 3 November 1917 with Cunningham's sailing from New York on board the S. S. St. Paul. After a description of a rough winter passage through the North Atlantic U-boat zone, the entries record the confusion, inconveniences, and hardships of wartime London and Paris and contain repeated expressions of homesickness, along with sometimes acid comment on the French people and culture. 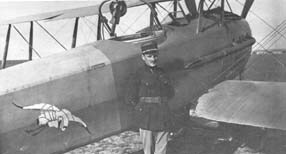 Beginning with the entry of 23 November, Cunningham records his visits to the French flying schools south of Paris at Tours, Avord, Pau, and Cazaux. Here he conferred with French aviators and flew in aircraft of many types. He was impressed with the skill of many of the Allied pilots he met but sometimes appalled by their recklessness and by the accident rate among the student fliers. Throughout these passages, also, Cunningham expresses straight-laced moral indignation at the fondness of many off-duty American officers for liquor and women. After another stop in Paris, the diary then follows Cunningham to a visit to the AEF Headquarters at Chaumont on 12 December, then to the Marine billets near Bourmont and Damblain and to front-line French airbases near Soissons. In these visits, he encounters American fliers of the legendary Lafayette Escadrille. The entries for 18-22 December, the most dramatic of the diary, tell of Cunningham's participation in combat missions with French pilots and a brief but vivid experience of trench warfare and artillery bombardment. The final section of the diary recounts visits to British bomber fields and seaplane bases in northern France and Belgium and a tour of the RNAF and RFC aerial gunnery schools at Eastchurch and Hythe, England. The last entries leave Cunningham on board S. S. St. Louis at sea on the voyage home. The diary is transcribed exactly as Cunningham wrote it, retaining his errors and idiosyncrasies of spelling and punctuation. The original diary was checked and prepared for reproduction by Mr. Charles A. Wood, Curator, Collections Unit, Marine Corps Museums. It was typed in its original draft by Mrs. Joyce Blackman, and edited and prepared for printing by Dr. Graham A. Cosmas. The photographs with which the diary is illustrated are from a scrapbook assembled by Cunningham during his tour of France which is now part o£ the Cunningham Papers. Mr. Rowland P. Gill, Curator of Photographs, Collections Unit, Marine Corps Museums, assisted in captioning these pictures, many of which may be published here for the first time. New York and S.S. "St. Paul"
Got up 6:30 a.m. after only 2:45 sleep. Went to paymasters for mileage checks. Saw Mrs. Whiting and received box from her to take to Ken Whiting in Paris. Got money changed and went on Board the St. Paul at 11:30 a.m. We sailed at 12:30 with only 47 first class passengers and apparently not many 2nd class. I have seen three women and a small boy. Had my last glimpse of Long Island about 3 p.m. Suppose there are a great many experiences in store for me before I see it again. I have stateroom 29 all to myself and think I am lucky to be on the Promenade Deck. Weather bad and ship cold and uncomfortable. Had late breakfast. Steward woke me and stated my bath was ready. Found a tub of sea water and a small tub of fresh water for getting rid of the salt water. This is to be the regular morning routine. Find we have on board Admiral Niblack; The Lord Chief Justice of England and Lord Northcliffe. Have also been told that we have $50,000,000 in bullion on the ship. We should be well convoyed with all this rank and wealth on board. We are not convoyed now and have not seen any kind of craft all day. Either the ocean is deserted or we are out of the regular track. The weather is beastly, blowing a gale, cold and rains and snows alternately. I have not been warm since I came on board except when in bed. Suppose they are training us for England conditions. I hope the submarines wait for warmer weather before trying to torpedo us. We are not worrying about torpedoes yet. Will save that for the war zone. At sea, S.S. "St. Paul"
Last night the wind rose to a full gale and seas began breaking over the forecastle. 12 bags of powder for the guns were washed overboard. Several men just escaped the same fate trying to rescue the balance of it. The gale was worst this morning but it has been almost the same all day and tonight green water is racing down the Promenade Deck. They say the barometer is going down, which probably means we will get it worse during the night. I will be perfectly satisfied to have it smooth down some. I am not seasick because I ate a normal dinner. Lunch was not quite normal. I have a headache which is a credit and I get dizzy occasionally watching the salon or stateroom continuously acting like that kite balloon at Philadelphia in a storm. It must rise and fall 50 feet and then dive sideways about the same distance. And the worst of it is, that it is practically continuous. Hope for better luck tomorrow. The storm blew itself out last night and it is fairly pleasant today, although the ship is still rolling and pitching considerably. It is so much better than yesterday that everyone is cheerful and some have been playing deck games. I have been studying French some today but without much success. I can't get my tongue to pronounce the crazy words. We are nearly a day behind our schedule on account of the storm. We expect to reach the danger zone day after tomorrow, Thursday. I hear we will be met by destroyers; probably to protect the Lords, Admiral and money we have on board. I am still wearing my uniform but suppose I will shift into "cits" Thursday as I understand the boches either sink boats with officers in uniform or capture the officers and I have no desire to needlessly spend the balance of this war in a German prison camp. We had target practice this morning with the guns. I helped spot. The target was a barrel thrown overboard. The barrel remained intact throughout the firing but we came near enough to it to make a submarine in its place feel uncomfortable. Two of the guns had missfires, which is not very complimentary to the ammunition we use. The "snifters" (Lts. Stewart, Smith, Tumey and myself) had ourselves kodaked. I was drawn into a shuttle board tournament today and have beaten everybody so far. We play the finals tomorrow. Late this afternoon we passed a tramp steamer going west. I suppose her crew will be on Broadway within a week. We will be in the danger zone tomorrow and I expect to put my "cits" on in the morning. I suppose I will freeze as I have no "cit" overcoat. The weather was very pleasant all day and I was perfectly comfortable without an overcoat but it is much colder tonight. A sigh of relief! One more day almost gone. It has been pouring rain all day. No games of any kind and not even a magazine to read. I finally in desperation joined a poker game and lost $4.50, but I believe it was money well spent as it took all afternoon to lose it. I am beginning to believe the danger zone is a myth. Everyday I am told that we will enter the zone "tomorrow" and we are not there yet. We only made 348 miles the past 24 hours, which is pretty slow going. The Captain says he hopes to get to Liverpool Monday and that we will reach the "zone" tomorrow night. I took off my uniform this morning and am now wearing "cits." I consider myself well "camouflaged." The only drawback is that I have no "cit" overcoat and am likely to be somewhat chilly if I have to take to the boats. We are at last in the submarine danger zone and ready for whatever excitement the boches have in store for us. The Admiral (Niblack) called all the officers aboard together and we arranged to stand lookout watches of 2 hours each for the balance of the voyage. My watch starts tomorrow. In addition to this I am to spot for 2 of the forward guns and will have to stay up on the bridge most of the time from now on. It is so thick and rough tonight that there is not much danger from submarines unless we accidentally run close to one. In which case, we have not a chance. We played the finals today in the shuffleboard tournament and I won after an exciting game. The ship was rolling so that it was quite a job. Some of the passengers got seasick all over again today. Think I will sleep with some of my clothes on tonight. We passed quite close to a tramp today. She had just run the gauntlet. Made 372 miles last 24 hours. Pretty slow going. Our first day in the submarine danger zone is over safely, but it was one of the most strenuous days I have passed. I went on watch at S a.m. Twilight is the most dangerous time of the day and everyone is extremely alert then. I stayed on watch until 10 a.m., went back on at 2 p.m. and stayed until after evening twilight. This looking for submarines is the most nerve straining duty I ever did. You must see them first, and, as their periscope is very small, the Odds are against you. You feel that the slightest negligence on your part might lose the ship and all on board. I freely strained my eyesight while on watch today. I am confident that I saw the periscope of a submarine today, but, as it did not reappear I might have been mistaken. The ten minutes after I saw it were anxious ones. We met our convoy of two U.S. destroyers (Conyngham and Jacob Jones) at 4 p.m. and were much relieved to see them. They were mottled all over with the most crazy colors and designs but they looked good to us, even if they were camouflaged to the limit. We were glad to see them, not so much for the slight additional protection they give as to the fact that if we are sunk, they will pick us up from the lifeboats. No merchant vessel is allowed to stop to pick up survivors of a torpedo ship. Without the destroyers we would have to drift around in lifeboats until some passing destroyer , found us. I personally have no desire to drift around the North Atlantic in an open boat for several days this time of the year. On the last trip this ship passed twelve 9 lifeboats full of people from a torpedo ship and could not stop to pick them up. They were found two days later by a destroyer. We passed some wreckage this afternoon but: could not make out just what it was. I have had a most 5 strenuous day and am all worn out. Another strenuous day is almost over. We entered the zone thickly infested with German submarines today and are still in it, At daylight we passed a merchant ship convoyed by two U.S. Destroyers. That is the only thing we have sect. I went on watch at 6 a.m. on the bridge and have been there most of the day. This morning we got a SOS call from some poor ship to the south of us saying that they were being chased by a submarine. We, of course, could not pay any attention to it. I hope he outran it. This afternoon 46 received a message that a mine field had been found directly in our course. We altered our course to the northward. The Germans are certainly keeping things busy around here and I understand are sowing mines everywhere. If we get through tonight, we are fairly safe. However, this St. Georges Channel is supposed to be alive with subs. We expect to sight the coast of Wales at 11 o'clock tonight if it is clear. At present it is misty and foggy. Will pack up tonight to get ready to go ashore at 10 a.m tomorrow. After another night of expecting to be torpedoed any minute we sighted the lightship off Liverpool and took a pilot aboard. Every one on the ship had a feeling of relief and we bade our good friends the destroyers good-bye and they headed for sea to convoy some other ship in. I admit that I was rather disappointed that we did not have a brush with a sub, but this seems rather foolish considering the number it would have endangered. We arrived alongside the landing float at 10:30 a.m. The tide rises 30 ft. here so the steamers land alongside a tremendous floating wharf. The immigration officer looked us over and then we were examined by the customs people. They were extremely nice and did not ask me to pay duty on all the tobacco and cigars I have. I then landed and could not find a porter so had to lug my own baggage all over the place. Took lunch at the Adelphi Hotel and had my first experience with the war food laws. I was allowed about 1/4 of a lump of sugar, no butter and very little bread. The filet mignon I had looked like a piece of tripe. Everything is fairly reasonable, however. We left the Lime Street Station for London at 2 p.m. in one of those dinky little compartments. The country looked very peaceful and attractive and we arrived at Euston Station, London at 7 p.m. They have the most pernicious system of carrying baggage. You have to get your own baggage put in the van and when we arrived in London everyone made a wild rush for the baggage van and there was a regular riot for a while. Everyone scrambling to get their trunks, etc. and when you found your luggage you had to then find a porter and when you found him you had to hunt a cab. After wearing yourself out you finally have a cab with your luggage all over it and can go to a hotel. I never saw so much tipping. Everybody who looks at you has his hands out for a tip. I finally arrived at the Savoy Hotel and Stewart, Tumey and myself have a suite together. We took dinner at Simpson's and I am now going to bed as the last few days have worn me out. Got up at 11 a.m. and started on a shopping trip. Went all through the Army & Navy stores and ordered a Sam Browne Belt. Walked all over town looking at shops etc. Everything is much higher here than in the states with the exception of food which seems to be plentiful and cheap. Butter and sugar seem very scarce and you are only allowed a small dab of butter and about 1/4 of a lump of sugar per meal. London is crowded and you see very few people without uniforms. The number of wounded soldiers around the streets is astounding and they are wounded in every conceivable way. Women are driving buses and are even porters at railway stations. In fact they seem to be doing everything they can possibly do. I did not see many ladies dressed in black but I am not sure that they wear mourning here. I went to the Embassy this afternoon to get transportation to Paris. T am to leave tomorrow afternoon. I came back to the Savoy and wrote to my sweet little wife. We all had dinner at Simpson's again and went to see Chu Chin Chow at His Majesty's Theatre. It was a very elaborate performance and must have cost an enormous sum to produce. The costumes were richer than any I have seen. After dark London is a dismal place. There is $500.00 fine for leaving a window shade so light shows through it. All the shop windows are screened and the only way to tell whether they are open is to try the door. There are very few street lights and these are screened so that they throw only a small light straight down. All of this, of course, is to make it hard for German air raiders to distinguish the thickly populated sections of London. They expect now an air raid every clear night. Clear nights this month are few and far between and I am afraid I will not see an air raid. This eternal fog has been with us ever since I arrived. It is a little damp but not at all unpleasantly cold. The streets are simply lined with women trying to pick up men. I am told the amount of disease is unbelievable. I am told that the Engliskmen are not very friendly with the Americans but do not know if this is true or not. Went to Hendon. Went to Army & Navy Store and bought Sam Browne Belt and dispatch case. Went to NavY Headquarters and secured transportation to Paris via Portsmouth and Havre. My train was to leave at 4 p.m. Tumey, Stewart and I went to the station with all my luggage and were informed there that the train would not leave as the submarines were too active in the Channel. We came back and went to Madame Toussard's waxwork exhibition. Do not consider it as good as the one in Paris. We met Smith and had dinner at Simpson's. We then went to see The Mountain Maid at Daly's. Was a very good show. When I arrived at the hotel I found a note for me to call up Paymaster Barber. I could not get the Navy Headquarters on this rotten London telephone system so went there in a taxi. Called up his house but he is not in. Is 1 a.m. now but will try him again. Think he wants to tell me to go early in the morning via Folkstone and Boulogne. Hope so. Just received word that I may be able to go by Folkstone at 11 a.m. Went around to Navy Headquarters at 10 a.m. and found there was no room on the Folkstone boat. Walked around town until 3 p.m. and got a taxi for Waterloo Station. I went through another scrimmage getting my baggage "registered" to Paris and put on the train. The process of getting baggage on the train at these stations is a cross between a football game and a lot of lunatics playing "tag." Looking after your baggage simply makes traveling a burden. I finally got settled in the dinky little compartment and rode through fog until 7 p.m. when I arrived at Southampton, cold and disgusted. They herded us in a smelly room to be inspected. After a long wait you fill out a blank containing a lot of impertinent questions and take it to a desk. One man reads it, asks questions and sends you to the next desk where the performance is repeated. After going to five different desks a man gives you a card and lets you go through a door. On the other side of it a man demands the card and your passport. He looked at mine and I thought, from the way the Frenchmen acted, that I would be shot as a spy. After the fuss was over I found that I had forgotten to get the passport visaed in London. After a lot of fuss they gave me a military pass and told me to get my baggage examined by the Customs Officer. Much to my surprise, he passed it without opening it. I got a porter and put it on the boat. The Paymaster in London told me that he had reserved a stateroom for me. I found the boat packed with people and no stateroom reserved. Fully 50 people including myself slept in deck chairs or anywhere they could get. I tried to sleep on the side seat in the dining saloon but between being nearly frozen and the awful smell of someone's feet, I got very little sleep and was glad to see morning. I went on deck expecting to see Havre, France and was disgusted to find that we had not sailed on account of the fog and would not sail until night. They do not allow any ship to cross the Channel in daylight on account of subs. They figure that these fast steamers are fairly safe at night. Traveling now is a simple test of endurance as no possible inconvenience is left out. I have not had my clothes off since I left London. The mob on the boat is a mixture of Russians, French, Portuguese, British and American officers and a surprising number of women, some Red Cross nurses. As stated, I came on deck and found I was still in Southampton. After the experience of last night I decided to try to get passage to France on one of the British transports where I could have a berth to sleep in. I looked up the U.S. Army Embarkation Officer and he finally gave me an order for passage on the Lydia and I thought I was fixed. I took the order to the Lydia and a British officer very rudely told me that he did not take orders from the U.S. Army man and that I would have to see some British official. Thinking of a good night's rest I trotted over and got the necessary order and was told to take my suitcase on board. When I got to the dock Lydia turned out to be a little tub of a boat. I could not find anyone on it but a very dirty sailor who told me they expected to take 250 officers on this trip. In looking for a stateroom I found there were no lights in any of the rooms, there was no bedding and the rooms and whole ship stunk something awful. I simply took my suitcase and went back to the ship I left, preferring to stay awake and freeze, at least cleanly, for another night. We sailed at 4 p.m. and passed on the way out a British seaplane station. 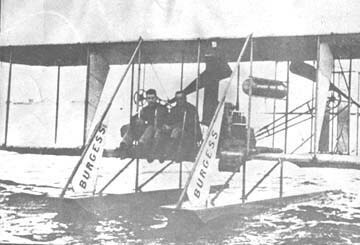 They appeared to have two seaplanes and four H-12 Curtiss flying boats. The harbor and passage past the Isle of Wight are elaborately guarded against subs with long nets and mine fields. We had to zig-zag a great deal and I imagine it was to avoid the mines. At the sea buoy there are two old forts out in the water with searchlights in every direction. The Channel is very smooth and we are making about 20 knots. The Captain says this water is infested with subs but he can outrun them at night when they can't see him coming and get in position to head him off. I have been talking with a very interesting young aviator named McGregor, of British Squadron no. 3. He had a fall and broke his lower jaw in three places. The doctors have fastened all his teeth rigidly together (both upper and lower) and he can't open his jaws for another month. The poor fellow can only get food by sucking soup through a space where he lost a tooth. I am almost dead from cold and loss of sleep and don't expect to get any tonight. I will be very glad to get to Paris, a bed and a bath. As I wrote this (12 midnight) we are just anchoring safely at Havre, France. Go ashore at 7 a.m.
We landed at 7:30 a.m. and went through the customs. I had expected to have trouble about all the tobacco I had but they passed my baggage without opening it. I found that the train for Paris did not leave until 5:10 p.m. I wandered around Havre in the morning. It is a typical French seaport with narrow streets and the harbor all cut up into basins separated by concrete and stone Quais. There is a French seaplane station on the Quai composed of about 6 seaplanes of the flying boat type. These boats seem fairly fast, have Hispana-Suisa motors, a machine gun and 4 bombs. They hoist them from the water with a derrick. There are 3 non-rigid dirigibles here also. Their hangars are out from town and I did not get a chance to see them. 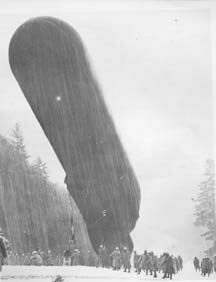 The dirigibles, however, flew back and forth several times at about 300 feet. One was a "Blimp" type and had 3 men in it. The other was larger and had 6 men and a propeller at each end of the nacelle. It was cucumber shaped with 2 rudders. They looked as if they were making 40 m.p.h. I walked out to Nice-Havre, a suburb of Havre where the Belgians have their seat of government and saw King Albert's temporary home. It is a summer resort and very pretty. There are several British hospitals here. I walked out with a British surgeon. He says the Belgians are as bad as the Germans and that both the French and English hate and distrust them. He says the Belgian Army is only allowed to hold a quarter of a mile of front and are watched as carefully as the Germans. King Albert is an exception. Everyone likes him. After the usual baggage scrimmage I got into a dinky compartment and started for Paris. Before I forget it I want to say that the U.S. Army Embarkation officers are the most inefficient lot I have ever seen. On the train I had my first experience with a European dining car. I was not very highly impressed with it. In fact, they do not seem to do anything as comfortably or as well as we do at home. They have the advantage of us in only two things: cheap taxicabs and well trained servants. We arrived in Paris at 11:30 p.m. I had a sick headache. The fog was so thick I could not see across the street and there were very few street lights. It was impossible to get a taxi this late and I did not know the way to the hotel. After trying for sometime to find out by sign language from porters where to go, I finally found a French soldier who offered to show me to the hotel and carry my suitcase. It was a blessing as that suitcase weighed a ton and my head was splitting. After wandering in the dark streets and fog I reached the hotel and took the last room they had. It had a bath and had water. I had not had my clothes off for four days and it was good to have a bath and a good bed. I took advantage of both. I hope I get a letter from my little sweetheart tomorrow. There is nothing I want more, except her. I got up at 10 o'clock and had breakfast in my room. I then got a taxi and drove to the American Embassy hoping to find a letter from my sweet little wife. Much to my disappointment the Embassy was closed. Will try again tomorrow. I walked around the streets in the afternoon. They are crowded with people, most of whom have uniforms on. There seems to be some of every army in the world here except Germany. The people are more cheerful than expected to find them. There does not seem to be any scarcity of food. Sugar and coal are very scarce. The French seem to like us very much. The shop windows have pictures in them of America in the act of saving France. I admire the French spirit after all they have suffered. I would be glad if this eternal fog would lift. I have seen nothing but fog since I arrived at Liverpool. It is depressing, especially at night with the very few street lamps. I don't like it, so I stay in my room or the hotel at night. I am very much handicapped by not speaking French. I do not enjoy being here as much on this account. I suppose when I get away from Paris I will feel the want of it still more. I went to see a panorama of French trenches and battles, had supper at Cafe Americain and then came to my room. I wrote my sweet little girl a letter. Hope I get one from her tomorrow. Am going to bed now. Got up at 9 a.m. and just after breakfast went to the Embassy hoping to get a letter from my little girl. There was none there and I felt awfully blue. Went to Navy Headquarters and saw Whiting, McCrary, Griffin and Hull. Whiting got a letter this morning mailed on October 30, which cheered me up some as I did not leave New York until Nov. 3. I am just existing now for a letter from my sweetheart. Took lunch with Whiting and went to Army Headquarters afterwards to report. They sent me to Aviation Headquarters where I saw Robertson, Milling and Culver. Milling said he would arrange my routing tomorrow;. Rode to the Provost Marshall's and registered there. Went back to hotel and had supper. After supper, I went to a vaudeville show but it was so bum I left early and here I am ready for bed. Would sleep better if I had a letter from home. Everyone I talk to is extremely pessimistic about the war. Most of them seem to believe it is hopeless to hope to whip the Germans and they are unanimous in saying that if we don't hurry the Germans will win. The French people, men and women, seem fairly cheerful but if you watch them closely they have a desperate tense look when not on their guard. My opinion from what I see and hear is that if we do not do something big next summer, it is all over. If we do, it will last two years longer and we win. Got up at 9 a.m. and went to see Milling at Aviation Headquarters to get my authority to visit the French aviation schools. He had not gotten it and told me to come back tomorrow. I don't like this delay. I don't want to spend all my trip in Paris. Paris is a poor place to live these days. Nothing at all to do after dark if you can't go to a show and they are tiresome when you do not know what they are talking about on the stage. So far I have just walked around with some officer for a while until we get tired and then came to my room and turn in. I went around to the shops today to try to buy something for my sweet little wife. Everything is very expensive and not as good as it is in New York. Will try again later when I know the place better. I have spent nearly all afternoon and could not find anything suitable. I feel as if today has been absolutely wasted and I certainly hope I get authority to start out tomorrow. I deposited my check for 2875 francs with the Farmers Loan & Trust Co. and got a check book. Paris is simply filled with U.S. Army Reserve officers, all holding down soft office jobs with very little to do, but that is the Army style to have two men for a one man job. I was surprised today to find all the shops packed with shoppers. Probably buying Xmas things. Suppose this will be another blue Xmas for me. Went to Embassy to see if a letter had come from my little wife but it had not. The officers there console me by saying it was a month after they arrived before they heard from home. Anyway, I am getting darned anxious for a letter. Went to see Whiting and saw Bill Corry who has a station near Bordeaux. Also Callan who has not been assigned a station yet. Went from there to Army Aviation Headquarters to get authority to visit French schools. They had done nothing so I took the letter myself to the French Minister of War office and got the pass in a few minutes. Went back to Milling's office and got letters of introduction. Met Lieut. McGregor, R.F.C. at seven and we had dinner with a much bewhiskered Frenchman who could not speak a word of English. We had the finest cooked lobsters I ever ate. After dinner we walked down the boulevard a while and now here I am. It is raining steadily, which they say is Paris weather for this time of year. It is strange, but we hear less about what is happening in the war than they do in the States. The newspapers are a joke. They are composed of one single sheet and what little there is in there is the briefest wording. I suppose it is on account of the censor and shortage of paper. The Paris subways are very good and convenient. They are better than ours except they are not nearly so fast. Taxicabs are cheap but at certain times of the day it is almost impossible to get one. Of course, these are the times you want one. Got up at 9 o'clock and went to the bank and drew out 500 fcs. Went over to the Invalides and saw all kinds of captured German guns and howitzers. Also the 4 nacelles of the Zeppelin L-49 captured recently and saw sections of the aluminum frame work. 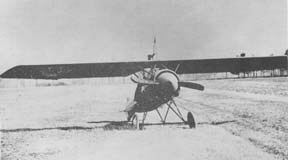 They had on view one Fokker monoplane, an L.V.G. 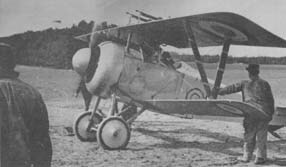 biplane and a Rumpler 2 seater which were captured in excellent condition. They were all interesting, especially the motors, one of which had 5 valves to each cylinder, 3 intake and 2 exhaust. The most interesting thing I saw was Capt. Guynemer's little Spad, the "Veaux Charles," which means Charles, old fellow. He downed 19 boches with this machine. The French have it decorated profusely with the tri-color and flowers all over it. I spent all afternoon looking for something to carry back to my little sweetheart. I remember she wanted an ivory toilet set and decided she would have it if it could be found. It looked hopeless until I asked Milling if he knew of a lady who would help me. He got the Comptesse to go with me rnd we finally found a shop that agreed to make one to order for me within three weeks. I hope I get it before I go back and I hope my little wife likes it. I thought I would have my photo taken to send her but found that it would take 3 weeks to get the proofs and 6 months after that to get the photos! At night I went over to the Latin quartier with a crowd to a studio and we went to the Theatre Femina. To bed at 11:30. Got up at 9. Tried to buy films for kodak. Could only find one store in Paris that had them and they would only sell 3 rolls. Left Gare de Orsay on 2:35 p.m. train for Tours. We passed through a very pretty country. There did not seem to be many men in the small towns. All the farming and plowing along the way seemed to be done by young boys. I saw very few women at work in the fields. I was surprised at the number of airplanes I saw flying. They were flying all around us all the way down and appeared to all be slow pushers. Probably Caudron training machines. I arrived in Tour at 6:20 p.m. and went to the Hotel l'Universe. There are a number of U.5. Army officers here who say they are guarding the Line of Communications. They have more than a regiment here at Tour out for the life of me I can't see why they are loafing around here or what there is here to guard. I should think they would have them up near the front getting ready to fight. Maj. Dunsworth came in the Hotel after supper and is going to send an auto in for me in the morning. The aviation camp, which has been taken over by the U.S. Army is about 4 miles out of town. Tours is where that pretty blue and gold china is made. The factories are closed now, however. Got up at 7 a.m. and Maj. Dunsworth had his Hudson at Hotel for me at 8. Rode out to the Ecole de Aviation, which is 2 1/2 miles from town. The weather was misty with a strong wind. Dunsworth met me and Lt. Knight showed me around the place. It is quite a big place with 10 very large wooden hangars and several Bessioneau canvas hangars. No flying on account of the wind. They have about 65 Caudron training planes and 2 Nieuport of chasse model but old. This place can be made into an excellent school but is in bad shape now. Saw my first German prisoners at work on the grounds. They appear satisfied with their lot and are good workers. There was one officer (not working) who strutted around as if he owned the place. I was surprised to see how loosely they were guarded. At 3 p.m. the wind let up and about 20 machines flew until dark The Caudrons fly better than they look. There was some looping. Saw the twin motored Caudrons and large Breguet used for the defense of Paris. They use Anzani and LeRhone motors in training machines. Seems to be very , especially the LeRhone. Am afraid Dunsworth is not much of a C.O. Most of the men who handle the machines are Algerians. There are a great many women working in the shops. Rode back to the Hotel with Dunsworth and had dinner with him. Wrote to my little sweetheart. Tours must be pretty in summer but is cold and foggy now. Is on the bank of the Loire. Has a very fine Cathedral. Wish the weather would improve. Got up at 6:30 a.m. in the dark to catch the train for Avord. In getting my tickets and baggage rechecked I found my French entirely inadequate. Got fixed up after some trouble. The train was an ultra local. It stopped every half mile. The railway runs down a river valley and, in spite of the pouring rain I could tell that it was very pretty country. We passed numbers of beautiful old chateaux, all of which seemed deserted. This is a wine growing section and vineyards are everywhere. One side of the valley is a high bluff for miles and this bluff is honeycombed with caves used for wine cellars and homes. Some parts of it were unusual and reminded me of pictures of cave dwellers cities. There seem to be U.S. soldiers in nearly every town we passed and I can't understand why they are scattered around this way instead of at some training camp getting ready to fight. I arrived at Bourges at 2 p.m. in a very cold pouring rain and found that I must spend the night here and go on to Avord tomorrow morning. I had quite a time finding a hotel as there were no cabs. I finally found the Central Hotel which is a barn and should be named Hotel Arctic. It is the coldest place I ever saw. I have done nothing but shiver. Will have to go to bed to get warm. This afternoon it quit raining and I decided I might as well freeze walking around as in the hotel so I walked around town and I am very glad I did. There are some of the most splendid old 14th century buildings I ever saw and the Cathedral alone is worth a trip here. It is a wonderful structure and I wish I had time to see ii better and explore it, While I was in it they had some kind of service and I felt like I was in the 15th century. A good many of the effigies are missing and I was told that they were destroyed during the French Revolution. The coats of arms have all been chiseled off. They were those of different royalists and the revolutionists erased them. The streets are the crookedest, narrowest and most picturesque I have seen in France. I wish the weather was clear enough for me to take some kodak pictures. If I had my good kodak I could get them. I will be glad to get back to Paris and be warm again. I have been frozen stiff ever since I left there. Although I just wrote my little wife last night I would write again if I wasn't so cold. I can't think of anything but her. I long for her to forgive all my disagreeableness and help me to be better and above all to love me, because that is all I live for. I was told yesterday that the censor sometimes simply tore up letters he did not like. I hope he has not torn up any of mine. Got up at daylight and walked 1 1/2 miles to station almost frozen. The sun was shining today the first time since I can remember but it has been very cold. Arrived in Avord at 9:30 a.m. and found that the aviation school was 2 miles from the station and no way to ride. I started out on foot in mud 2 inches deep and my feet were wet and freezing when I arrived. Was introduced to the Commandant, Col. Fabre, and the Chief of Flying, Capt. Levy. Both were extremely nice. The Colonel cannot speak English so I cannot know him well. Capt. Levy was manager of a South American railroad and speaks English very well. He is the real head of the school and has a very fine organization. This school is larger than all the other schools in France combined. They have 800 airplanes in commission and have 11 flying fields besides the big one at the main station. There are 3000 mechanics here. They have every kind of machine here made in France. This afternoon I made 10 flights to the different schools with Capt. Levy. He has the reputation of being very reckless and he lives up to it. I was asked to mess with the Commandant and the 3 senior officers, which the other officers seemed to think is a special honor. I have a room in the officers' quarters which is a wooden shack and cold as a stable. I will certainly be glad to get back to Paris and be warm again. My bed consists of a cot with one blanket and a sheet. I am going to sleep in my underclothes and put my overcoat over me and expect to freeze anyway. I have received the best impression of the business side of the war here. Everyone here is in dead earnest and you can realize the grimness of it when you realize that an average of one man a day is killed flying here. This afternoon we flew low over the wreck of a machine in which a pilot was killed yesterday. They keep the deaths as quiet as possible and I do not know if anyone was killed today or not. I talked to several pilots who have flown over the lines and Lieut. Privat, who has 4 boches to his credit is going to show me his log tomorrow and tell me some of his experiences. I wish I could stay here longer as it is a most interesting place. The pilots from all the primary schools in France come here to prepare for the finishing schools at Pau, Cazaux and LeCrotoy. There is an American ex-ambulance driver here named de Roode, who is a lieut. in the French Army now. He is detailed as my guide around the place. I am afraid he is somewhat of a jack-leg, but he has been very nice and accommodating to me. I spent a few hours tonight in the officers' club, or Circle Officers, where all the officers gather and have tea or coffee and play cards when off duty. There are 4 Russians and 2 Cossack officers here training. They do not seem to be very popular with the French. Had a miserable night. My shack of a room was like an iceberg and when I got in my straw bunk with 1 sheet, 1 blanket and my overcoat I was frozen and discovered that the sheet was almost wet it was so damp. I was sure I would have sore throat, rheumatism etc. this morning but haven't even a cold. I got up at 9 and started on an inspection of the shops and machines. There was Z inches of snow on the ground, much to my surprise. Later it started raining and the mud is deep, plentiful and aggravatingly sticky. I was glad to have my heavy boots. I examined carefully all the different airplanes and practically finished my work this afternoon. Tonight I had a talk with Lieut. Privat and he told me his experiences over the lines. They were very interesting. He has gotten 8 boches instead of 4. At dinner the officers asked me if the Russian situation would discourage America. I told them no. They are staking everything on our doing something big next Spring and I am afraid our Army is going to disappoint them. Several Army officers drove over from Issoudon today and blustered around the place taking pictures without permission and generally acting without respect or courtesy towards the French. I could see they were much annoyed and at dinner I know they were making fun of them though they spoke in French and thought I did not understand it. I was ashamed of the Americans myself. Wrote my sweet little wife. Now to my iceberg of a straw bunk to shiver for awhile. Got out of my straw bunk at 8 a.m. and shaved with ice cold water. De Roode was not at the Circle de Officers so had to wait for him until 9:30. Paid all my bills and then went to Capt. Levy's office where he explained in detail his system of Cunning the school. He is an efficient officer, fine pilot but is certainly conceited and brags all the time about it being impossible for him to have an accident. He had better look out. At lunch I bade the Commandant and other officers good-bye and they seemed sorry to see me go. Several of them have asked me casually why the Naval and Marine officers are so much better men than the Army officers. They do not seem to like the Army officers at all. Capt. Levy sent my baggage to the train and had it registered and sent me to the station in his private car. If it were not for the discomforts I would like to stay at Avord a while. The French are the dirtiest people I ever saw. Their streets, houses, buildings and sanitary places are filthy everywhere I have been. The toilets at Avord are of very novel construction and, as a result, I will have to take a purgative tonight. I left Avord at 2:07 and arrived in Paris at 7:30 p.m. After the usual mess with baggage and taxis I am at the Grand Hotel again and expect to have a pleasant and much needed bath and go to bed. I can hardly wait to get to the Embassy tomorrow and see if I have some letters from my sweet little wife. I will certainly feel blue if they are not there. This is Thanksgiving Day but I have no symptoms of feeling thankful. There are a lot of things I should be thankful for but they do not present themselves. I am thankful that I have a good sweet little wife and that is all that occurs to me. I have been as blue as indigo all day. I had banked on getting some letters today and went to the Embassy full of expectation. There was hot a single letter for me. I could hardly believe it. The censorship is a crying outrage. There are thousands of Americans who, like me, have someone at home they love and a letter from them means everything and still by inefficiency they delay the mail a month. This is a worse hardship than the fighting. When I found I had no mail I lost interest in everything. I intended to go out to the Spad factory but did not. I found that Whiting and the others I know were out of town so I walked around the streets some and read a little. I hate Paris. It is nothing but money grabbing shop keepers, soldiers and women who are so painted and powdered that you are disgusted even by looking at them. From my experience with shop keepers I think the whole French race is two thirds Jew. I will be traveling in the south of France for the next 10 days, so there will be no chance to get a letter until I return to Paris. I don't know how I will stand it. Paris is simply filled with U.S. Army officers who seem to have nothing to do. It is the biggest graft I ever saw. Why don't they send them to the front and make them work. Got up late as usual and had to rush to catch the 8:27 train for Pau. The day was fine. The sun came out part of the day for the first time in weeks. It certainly looked fine and changed the appearance of the whole country. We passed through the valley of the Loire and saw beautiful chateaux in their picturesque surroundings. This country must be very pretty in summer. There were some exambulance men returning to New York from Bordeaux tomorrow. I envied them getting back to America. Wrote on the train to my little wife and McIlvain so the ambulance men could mail the letters on the steamer, thus getting around the long useless delay caused by the U.S. Army censors. Poitiers is a queer looking place but also attractive. A large part of the city seems to be built in the side of a high cliff, part of the houses being in the cliff and the other part projecting out. We arrived at Bordeaux at 6:08 p.m. and I had to change trains. My train for Pau left at 6:30 p.m. so I did not see anything of Bordeaux. My train was rather slow and crowded and I could not find a good seat. I took dinner in the wagon-restaurant, which helped to break the monotony. The last part of the trip is through mountains. There was a bright moonlight and the scenery was well worth looking at. We arrived at Pau at 12 midnight, 48 minutes late and I was surprised to see a fine automobile bus to take me to the Hotel de France. It looks like the best hotel I have seen in France. My room was fine and looked good after a 16 hour trip on a French train. The bed is great. Wish I could take it home to my little wife. She would revel in it. Since I did not get to bed until late last night I got up at 10 this morning and found that the Ecole de Aviation is 10 miles out of town and the train goes out at 1:30 p.m. I killed the time by walking all over this quaint old place. It is built on a plateau with all the fine places along the edge of a high cliff overlooking a very pretty river valley. There is an incline railway from the valley and railway station to the town. From the cliff you can see across the valley numbers of fine chateaux and the snow covered peaks of the Pyrennes Mountains behind. It is great. Pau seems to be the birthplace and stamping ground of Henry IV and his name is on most of the place. For some unknown reason the train to the Ecole decided to leave at 1 instead of its scheduled time of 1:30 so I missed it and cannot get out until tomorrow. Lieut. Rolph, a U.S. Reserve officer is stationed here. He does not know why and has nothing to do. He took me to Mrs. Ridgeway's for dinner and made so many faux pas I was ashamed of him. Among other things he asked a young lady if a woman he saw with a priest was the priest's wife. I met the Duke of Orleans, who is here as a student flyer and the Duchess of D'L Ambrosia. Rolph is trying to be pleasant but he is an awful bore. The sun shone this morning but it is raining again tonight. Everything about this hotel is fine, especially the view. Got up late as today is a repose day at the Ecole and there will be no flying: Walked around with Rolph and met Capt. Levy from Avord. At 1:15 went out to the Ecole and found everything locked up except the hangars. Saw some captured German machines and all the wrecks which have happened in the last few days. Saw the machine in which young Fowler was killed day before yesterday. It was certainly a wreck and had blood all over the cockpit. I saw pieces of Fowler's flesh still hanging to the windshield. They kill here more than 1 pilot every day, which, when one thinks of it, is an enormous percentage. There must be some fault with their training methods. The Ecole is much smaller than at Avord and they use only the Nieuport machine. There is the main field and four small fields nearby. It is 10 miles from Pau on a dinky train road. We came back to the hotel and had dinner and afterwards Bradley, an American in the French Flying Corps played the piano and another man sang. In our little party was the Duchess (who is 18) and Countess Bourg. I am certainly getting chummy with the aristocracy. I must get up very early in the morning so had best get to bed. I wish I could see my sweet little wife tonight or at least know what she was doing and thinking about. It is only 7 o'clock at home now. Got up at 6:15 and caught the tramway for le Ecole and had coffee there. The Commandant was not in so I went to the acrobacy field and witnessed some of the finest acrobatic flying I ever saw by Sergt. Petib and another flyer. They did everything that can be done with an aeroplane. I came back to the main field and looked around waiting for the Commandant. He showed up at 2:30 and I did not like his looks at all, He detailed a bewhiskered officer who could not speak English to show me the different fields. I took my interpreter along. We drove to the 4 branch fields in an auto. I saw Bleriot and Wright's first hangar. On 1 field I saw 3 machines lying on their backs but could not find out whether anyone had been killed or not. By the time we visited the last field it was time to catch the 4:30 train to Pau, The day has been clear but cold. They have several captured German machines here. I saw an Albatross which was a beauty. They use Nieuports for training entirely and I think they are very good. Everyone here says we should finish our pilots in America. We, Rolph and I, invited Lieut. Rend Simon who is in charge of the acrobacy field, and his wife to dinner. She is American and they are both very nice, We sat and talked until a few minutes ago. As I have to get up early again, I am going to bed now. The Duke of Orleans is drunk and the Duchess de l'Ambrose is flirting. Don't think much of this aristocracy. My opinion of the mass of French people is being rapidly lowered. Most of the officers, however, seem to be very nice. The Pyrennes were a wonderful picture today. Lt. Rolph said he has arranged to get an auto and we would drive to Lourdes this morning. Lourdes is a wonderful place about 20 miles from here that everyone says I should not miss. The scenery is wonderful and pilgrims come there from all over the world to be cured by miracles. There is a strange tradition attached to the place. Instead of asking the Commandant honestly for the car Rolph tried to fool him. When the car arrived it was necessary for it to go back to the Ecole to get permission to leave town. A few minutes before my train left the Commandant called me up and said he would be glad to give me the car for the trip and ignored Rolph. Of course I had to tell him that I was leaving at 12:50 and could not go. I was very disappointed and blame Rolph for his crookedness causing me to miss the trip. I hated to leave Pau and hope to come back there sometime. My train was very slow and I had to change cars at nearly every station. At Lamothe I had to wait 2 hours. I arrived at Arcachon all tired out at 8:30 p.m. and am at the Victoria Hotel but don't like it much. This is a summer resort on the seashore and I came here because there is no hotel at Cizaux. Will go there in the morning. The trains in France are fierce. It's a test of endurance to travel on them. One of the worst features is the odors. I believe the French are the dirtiest people. I have smelled more unpleasant and unnecessary odors in France than in years at home. They are filthy. I left a call for 6 this morning to catch the train for Cazaux and they did not call me. I raised a row with the hotel and walked down the street looking for another hotel. I saw a U.S. Navy Ford standing in front of a house and asked whose it was. I was surprised to find out that it was Lt. who was my assistant at Pensacola. I woke him up at once and he asked me to live in his house while I was here, so I moved in. He is in charge of a few men at Cazaux and drove me there in the Ford. Much to my surprise, Cazaux is the most interesting place I have been. They teach machine gun and cannon fire from airplanes and the whole course from school room instruction to the firing at the "manche" or sleeve towed by another airplane is very thorough and good. Cazaux is on a lake and they use water as well as land machines. Some of the flying boats have 2" cannons on them. I shot some with the machine guns and afterwards made a flight and practiced firing at silhouette targets from the air. It is great sport. I had sleeping car reservations from Bordeaux to Paris for tomorrow night but there is so much here that I should see and learn that it would be criminal to leave that soon so I got to phone Bordeaux cancelling my reservations and making another for Sunday night. I will stay here until then. I took dinner with 8 captains in command of French escadrilles at the front. They are here for a conference with the Commandant and their tales of fighting at the front were intensely interesting. Several invited me to visit them at the front. I hope I have the opportunity. The weather today has been ideal and sunshiny. We left Cazaux for Arcachon in the Ford at 4:30. ------ does not seem to be doing any work at all so far as I can see. When we arrived at his house I was surprised to be introduced to his mistress. I was thoroughly disgusted. She is a coarse, rather fat and thoroughly unattractive woman and I do not see how any decent man would even voluntarily shake hands with her. I was still more disgusted when they hugged and kissed each other every few minutes during dinner. They are both so common and coarse J hate to stay in the same house with them. If they don't cut out their familiarity when I am around I will go back to the hotel. If it were not for the Ford I would do it anyway. I may have lots of faults but thank God that kind of thing disgusts me and I could not lose my self respect that way. It took lots of sense of duty before I could decide to stay here until Sunday as I expect to find some letters from my sweet little wife when I get to Paris, and I will be miserably impatient until I get them. I don't know anything I want more except her. After spending a miserable freezing night in ------'s "harem" I got up at 8 and wore my light weight clothes. The fog was so thick all day you could cut it with an axe and it was the most penetrating cold I ever felt. I was simply frozen all day. I spent the day having Sergt. Privot explain the course at the school to me. It was very interesting and instructive. There was no flying on account of the dense fog and very little shooting. We went back to Arcachon in the evening and I reached B chilled through with symptoms of grippe and sore throat. The house was like an iceberg and to make things more uncomfortable, ------'s mistress found a letter from 1 of his other mistresses and they had a scene. I decided I could not stand any more of this kind of stuff and that I would not spend another night in the house. I went to bed in a cold room with a fever and headache and had a restless night and a horrid dream about my sweet little wife. I fully expected to be quite sick in the morning. I will certainly be glad to get back to a hot bath and comfortable room. I think I need a doctor also. Most of the American officers are behaving scandalously over here but I think ------ is the worst. He claims the others are just as bad but I don't believe it. I think he has syph. I woke up this morning feeling very badly but not as sick as I thought I would be. ------ was also sick. We drove to Cazaux and found it a bright sunshiny day. 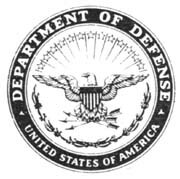 I looked over the submarine fighting squadron and was interested in the bombs and cannon. I felt too badly to do much work. ------ sent his car to Mousick. I decided I had to get to a comfortable room and some medicine or I would be layed up sick, so decided to go to Bordeaux this afternoon. I had a hard time getting to La Test to catch the 4:30 train but finally made it in a French truck. The train was overcrowded with soldiers returning to the front There must be something special on up there. Near Cazaux are camped 8000 Russians who won't fight and won't obey their officers. They just eat and hold meetings. They had an uprising recently and in the fight 2000 were killed. What to do with them is a problem for the French. I arrived in Bordeaux at 6:30 and the fog is worse than London. I got a very comfortable room at the Hotel de France and am going to take a hot bath, some liver medicine and go to bed. I feel awfully bad and am afraid I will be sick. I wish I had my little wife to look after me. I never was so lonesome for her. I wonder what she is doing tonight. I got up this morning feeling badly and had my breakfast in my room. I did not dress as it was raining and I was afraid to go out. I wrote up my notebook which was badly behind and repacked my trunk and suitcase. Had lunch in my room and dressed at 4 o'clock to look around Bordeaux. It had stopped raining but was very foggy so I could not see much of the place. It is larger than I thought. I met Col. Catlin on the street and learned that he was commanding 1500 Marines near here. He says his men are satisfied and he expects to go to the front in about a month. I am still just on the verge of an attack of the grippe and don't know whether I can stave it off or not. I left Bordeaux at 8:20 p.m. and am writing this in my Wagon-Lit compartment. This is my first experience with French sleeping cars. The compartment is very nice with 2 berths, 1 over the windows lengthwise of the car and 1 lower and crossways of the car. There is a very nice little wash room which is shared by the next compartment. The motion of the train makes writing difficult. Wrote to my little wife tonight before leaving Bordeaux. Arrive in Paris at 8:06. Don't like the French Wagon-Lits. The berths are much too narrow and it is not comfortable sleeping crossways of the car. Arrived in Paris at 8:06 after a restless night. Decided to go to Continental Hotel for a change. As soon as it was open I was at the Embassy absolutely sure I would find some letters from my little wife. I could hardly believe them when they told me there were none. It gave me a real shock. Hope dies hard and I thought they might have sent them to 1 of the numerous Army and Navy offices scattered over Paris. I spent nearly all day going from 1 to the other of these offices trying to find a letter. I gave up when I had been to them all. I simply can't understand it. I have received an official letter mailed from Mineola on Nov. 10th. I am absolutely positive Josephine has written me. She would not under any circumstances treat me that way. But why don't I get them? I go to the front day after tomorrow and if 1 does not come tomorrow I cannot get 1 for another 10 days of misery. I saw Chevalier today but was so blue I did not have much to say to him. I have been way down in the dumps all day and have not been able to raise enough interest to try to work. It would pay the government to send me cables from home if they want to get any work out of me. Tonight, in desperation, I went to the Folies Bergere but did not enjoy it. I came home early and am going to bed. Went around this morning in the vain hope that I would find a letter. Same luck. Not hearing from home yesterday upset me considerably. I went to bed early last night but did not get to sleep until 3 a.m. and I tormented myself by imagining all sorts of horrible things. This morning I looked at it more sensibly. I know, of course, that Josephine has written me and that the reason I have not gotten her letters is on account of the inefficient censor and mail service. I will be away for 10 days now but will surely hear from her when I return. It will be a hard, miserable 10 days but I suppose this is war. It does look like this hardship could be prevented though, I spent the morning at Aviation Headquarters and this afternoon Maj. Davison, Maj. Dunsworth and I started out to see the Spad Factory but after walking over 1 section of Paris, could not locate it. As I have to catch the early train for Chaumont, 1 am going to bed at 9 o'clock. Paris is crowded with Xmas shoppers. Everything is higher here than in the States. I have bought my sweet little wife a present and it took 3 days hard work to find someone who would make it. I am not going to try to take anything home to anyone else as I have no room and the customs people are very unreasonable I am told. I am looking forward with dread to another blue Xmas away from my little wife. I will probably be on the front where there will at least be plenty of excitement. Left Paris at 8 a.m. for Chaumont. There is a great difference in everything when you go toward the front. Your papers are examined often and everyone seems to be more on the alert. I noticed that the closer we got to the front the fewer people you see and there are none of the usual loafers at the stations. Arrived at Chaumont at 12:06. The place is full of American officers and soldiers. I passed 3 encampments of Americans just before we arrived. The headquarters are on the edge of town in an old convent of some kind. It is rough and unfinished. Saw Gen. Harbord and reported. Then arranged with the aviation people to go to 2 squadrons on the French front and 2 on the British front. Hope to go to some near Soissons as I hear there is activity there. Saw Harmon who is now a major. Took dinner with Col. Lahm and Nm. Thaw of the LaFayette Escadrille who flew down here from the front this afternoon. All through dinner and until 11 o'clock tonight Thaw told stories of his experiences and those of other pilots. It was very interesting and instructive. I will not get my authority to go to the front until day after tomorrow so will return to Paris and wait there. There is real war atmosphere here. And I am at last beginning to believe there is a war going on. Got up to go out with Lt. Wm. Thaw to see him off to the front in his Spad in which he has shot down S Huns. I was late and Thaw had gone to Headquarters so I drove out to his machine and waited for him. His Spad looked a little the worse for wear and there were numbers of bullet holes in it. I then drove by auto to Bourmont to see the Marines. I went one way and came back another and enjoyed the scenery very much except I was frozen stiff and my rheumatism bothered me lots. Found the Marines are around Domblain but took lunch with Maj. Gen. Bundy and Col. Feland who is his Chief of Staff. Bourmont is a medieval village perched on the top of a very high hill and it is all straight up and down. The officers are billeted in the houses of the village which are not any more comfortable than a stone stable. They say they don't know what heat and hot water are like now. The men are quartered in wooden huts and are fairly comfortable except for the cold and no hot water. I returned to Chaumont in the afternoon and arranged for my trip to the fronts. The authority will not arrive for 2 days so they suggested that I return to Paris and wait for it. 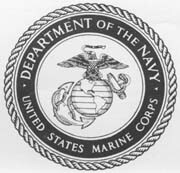 Gen. Pershing's Chief of Staff sent for me and asked me what Marine officer I thought would make a good member of the General Staff. I caught the 5:30 train and arrived in Paris at 10 p.m. The train was filled with officers from the front coming to Paris for a few days leave. They all seemed to be telling each other of their experiences and I would have given anything to know enough French to understand them. There is a marked difference in everything when you go toward the front from Paris. There is a business like atmosphere and everyone looks like they have important work to do. You don't see this south of Paris. Got up at 9 a.m. Went to see if my kodak pictures were finished. They were not. Tried to find the Spad factory until late in afternoon. Did not find it. Every place I was told it was turned out to be the wrong place. Will try again some other day. I have been bitterly disappointed so many times at the Embassy that I dreaded to go there and ask for mail. Late in the afternoon, however, I got up my courage and went there expecting the same luck. I almost hugged the man from pure joy when he handed me a letter from my sweet little wife. It was mailed from Washington on Nov. 26, only 18 days ago! And it was marked "no. 7" showing that my sweet little girl had written me 6 letters before that. I would give anything to know where those letters are. Some may be at the bottom of the ocean. That is all the proof needed of the inefficiency of our mail service In this precious letter she writes as if she had not received any letters from me. I must have written at least 20 or 25. If it makes her as miserable not to hear from me as it has me not hearing from her, I certainly sympathize with the sweet little thing. No one will ever know what supreme joy this first letter gave me. Just to know she is well and safe and loves me was worth a million dollars to me. I really feel like a new man. I was so happy I did not do anything the rest of the day but think how good I feel Love her? Why, I worship the little brat. I went by Aviation Headquarters and found that my orders to the front can't come until tomorrow, so I will have to spend another day in Paris. I am going to repack my trunk and grip and write to my wife and then turn in. I am impressed with the fact that the behavior of the women and the men is opposite from in America. The women are aggressive and if someone half knocks you down in a crowd, which happens often, you know without looking that it is a woman. The men are polite and considerate. I have been sorely tempted to slap some women who shove you around with absolutely no consideration. They are not backward about making advances, either. Got up at 8 a.m. and went to Maj. Wills' office to see about expense account. Prom there I went to Aviation Headquarters to see if my orders to the front had come. They had not, so I went out to see the Spad Factory. It was extremely interesting. The workmanship is wonderful. It hardly seems to be possible to build a machine lighter than they have and it is strongly built too. The way they mounted the 1 1/2" cannon in the motor and the automatic loader were interesting. Their 300 h.p. experimental machine flew the wings off of it and buried the pilot 9 ft. After lunch I drove out to Villacoublay, the largest aviation station in France. It was well worth the trip. It is where all the new types of machines are tried out. I never saw so many different types before. From the big Voisin triplane that looks like a battleship down to the little 150 m.p.h. Morane parasol. The Morane and Nieuport Monosoupape are so fast that you wonder how a man can live in them. I came back at dark. My orders have not come yet, which means I will have to stay here another day. At the hotel tonight I met Maj.------ about half full with a disgustingly painted up little French street walker he calls Lulu. It makes me sick the way some of these married officers in France have already contracted diseases. I was tired after dinner and came up to my room and have been writing up my notes. My rheumatism is uncomfortable tonight. I feel like a new man since I heard from my precious little wife yesterday. I bet I have read her letter fifty times and expect to read it some more. I am afraid these lazy Army officers are going to mess up my plans by delaying my orders to the front. They never seem to do anything on time or well. Orders came and I left for front. Glad to get away from Paris but weather is miserable. Been snowing all day and there is several inches of snow on the ground. Arrived at Hdqrs. 4th French Army about noon. Met by staff oar. On way up everything was impressive of war. Your papers are examined everywhere and soldiers in steel casques are always in evidence. On every siding are ammunition, guns and troops. Roads are filled with long lines of supply wagons and artillery going to the front. It is all businesslike and impressive. They were extremely nice to me at Hdqs. A staff officer showed me all the maps and explained how Army is run, information of the enemy gotten and noted on the different maps. Am staying with the Captains' Mess tonight. They are fairly comfortable but the place is like an iceberg. So cold I can't write anymore. Got up frozen stiff and left after breakfast in a staff car for the 13th Groupe of combat machines. They are just behind the line of balloons with hangars around the edge of a wood. The Groupe is composed of the 65th, 85th, 15th and 124th Escadrilles. The 124th is the LaFayette Escadrille at LaCheppe. The others are at La Noblette. Saw quite a lot of the LaFayette pilots. The pilots live in huts of rough boards and the wind whistles through with little obstruction. Can't describe anything as my hands are numb with cold. There is a line of old trenches on side of field which soldiers off duty use in practice drills. These poor soldiers are really pitiful and are thoroughly sick of the war. Just in front of us are the line of sausage balloons. They look queer hanging up there. It cleared up in the afternoon and I saw very interesting sights of antiaircraft shells bursting around our machines. Two or 3 boches came out and I saw our pilots go for them. It was certainly pretty but the boches all got away. It is so cold I can hardly write. At dark 2 of our pilots had not returned and we were uneasy about them. At 8 p.m. we called up the advanced artillery and they said the last they saw of them they were in German territory fighting 3 boches. We were worried until 1 came in on foot at 9 p.m. and said they had gotten lost and landed several miles away and walked to camp. At night I noticed the artillery more. It sounded like a pitched battle to me but it is just the ordinary thing. Too cold to write more. Got up frozen stiff. The weather fairly clear. Persuaded a French pilot of a biplane fighting Spad to take me over the lines. We went up like an elevator and talk about speed! Wk were over the lines in no time and I was all eyes. The archies bursting near us worried me some and made it hard to look all the time for boches. I saw something to one side that looked like a fountain of red ink. Found it was the machine gun tracer bullets from the ground. After a few minutes we sighted a boche 2 seater just below us. We made for him. It was the finest excitement I ever had. I got my machine gun ready. Before we got to him he dived and headed for home. On 1 of our rolls I let loose a couple of strings of 6 at him but it was too far for good shooting. After following him a ways over the lines we turned to look for another. None were out so we came home. Finest trip I ever had. If the boche had not turned quite so soon, I think I might have got him. Watched pilots doing stunts in afternoon. At about 8 p.m. we were huddled around a small fire in the hut when we heard 3 boche machines fly over very low. Two of them did not locate our place and went on. We went outside and saw the other 1 flying around trying to locate the hangars so we made for the machine gun pit. He finally flew down the line and let go a couple of bombs, as he came over we opened on him but the gun jammed and no one could fix it in the dark. He made 3 trips and let go 2 bombs each trip. Then he left us. We found he had dropped them all in the woods and no machines were hurt. We went back and tried to sleep but every time a big gun would go off I thought it was another raid. I am writing this Wednesday night with my hands blue from cold. There is certainly no lack of excitement around here. Walked 6 miles before daylight and went in the trenches. They are filthy and horrible. Don't see how the men stand it. The stink of dead Huns in front is awful even in this cold weather. Soon after daylight I followed a party cleaning out an old communicating trench with hand grenades. I went until I saw 4 boches killed by grenades and 2 bayoneted and 1 poilu shot through the head. It was sickening but I suppose I would get used to it. Everyone does. Late in afternoon the boches began shelling the trench and we retired to dugouts. I stood in the observation post a few minutes to see the show: but only until a shell landed near and the shock nearly knocked me over. I hunted the dugout also. One observer was wounded. After dark we started for the rear and I was relieved to get some pure air. After walking f miles in the cold I am writing this. The shells bursting at night are very pretty. It has been a rather exciting day. Clear this morning and snow practically all blown away. About 9 a boche biplane came over and a Frenchman from 65th tackled him. The fun only lasted a minute and Mr. Boche came spinning down and fell in a field just across the road. We were there in no time. Both were killed, of course. Pilot had a bullet in his head. The observer was killed by the fall. The photographer went over and took a photo which he promised to send me. About an hour later another boche came over and 2 Frenchmen from 15th shot him down but he fell some distance away and I did not go over. Watched the Archies trying to hit our machines the rest of the day. Left for train by auto at 6 p.m. and arrived Paris 10 p.m. Too tired to write more. Left on early train for Hdqrs 6th French Army. Nearly froze on train. Met by auto and taken to Hdqrs and from there to Corps d'Armee Groupe. A big Latourd was getting ready to take photos. I went along in the front seat. Had 6 fighting machines above us. Saw no boche but Archies were bursting uncomfortably near for me, Took our photos and were back in 45 minutes without anything unusual happening. Rest of afternoon they showed me their system of taking finishing and distributing photos. Drove back to Soissons frozen stiff and with rheumatism giving me hell. Billeted in old barn of hotel. Writing this half frozen. Bad a most exciting day. Went very early to the Bois de Boche to see artillery and watch trenches from observatory. Wore big French fur overcoat in addition to my own. Went through old boche system of trenches and tunnels at Bois de Boche to the observatory. Fine place. Could see the lines for miles. Watched our artillery shell a boche blockhouse. Saw boche form a box barrage, but our artillery shelled them so heavily the raid was not successful. There is lots of activity here today. The colonel says it is because the boche are nervous. Watched 2 persistent boche airplanes being shelled. On our way out we stopped at a battery of 75's which was shelled the day before. On our way to the captain's dugout the boches started shelling it again. The second shell hit near us and knocked me into a shell hole. My casque was knocked off and dented by a fragment and after we reached the dugout we found that another fragment had taken a patch of fur off the shoulder of the French overcoat and bruised my arm slightly. They must have fired 20 102mm shells. One shell caved in 1 entrance to the dugout, another ruined a gun and a third buried 200 rounds of our ammunition. We waited half hour after the firing stopped and then beat it out of danger. The captain let me keep the casque I wore as a souvenir. In hurrying to get away from the battling I got very hot and then very cold driving the 30 miles in auto to catch train. Train was frigid so I had a very bad cold when I reached Paris. Spent morning getting my sweet little wife's present, some money and looking for mail. None for me. Cold and rheumatism so bad will spend night here. Been in bed all afternoon. About dinner time maid said the air raid warning was given. I got up and went out to see the fun. Streets were dark and practically deserted. Pretty moonlight night. Watched French machines of Paris patrol flying back and forth over city until 10 p.m. Decided it was a false alarm and went to bed Feeling pretty sick. Left on early train for Amiens to get authority for British front. No one knew anything about it. Most miserable and uncomfortable place I ever saw. Left for Calais and arrived frozen and sick. Ache all over, especially my side and back. Room like an iceberg. Was sick all night. Xmas! Got up so sick could hardly walk. Decided to get to American doctor at Dunkirk as soon as possible. After most miserable trip I ever had, arrived at Dunkirk, went straight to bed and sent for doctor and was away on a drunk with French officers but doctor came promptly and said I had kidney stone, a very bad cold and rheumatism combined. The pain in my side was getting unbearable so he gave me some dope and put me to sleep. This was a Merry Xmas--I don't think. I wished 14 million times my little wife was here. In fact, I can't think of anything else. After a restless night I woke up with the pain almost gone. Doctor came around and said I would have to stay in bed all day. ~ has not shown up and no one knows where he is. HE is liable to be away drunk for several days. If doctor will let me I am going to the front tomorrow. Wonder what my sweet little wife is doing. Will certainly be glad to get back to her. It is fierce being in bed all alone in this Godforsaken place. Woke up feeling better but not well. ------ came in. He had been on a tear with French and British officers. Got up and drove to his station. It is too crowded and in a bad location, They have 17 machines ready but are not flying. Took lunch with , Dr. Stevens, Bates and the Warrant, In afternoon drove to San Paul and saw R.N.A.S. station, watched the flying and looked at the British photos. Took dinner with . Went to room early so I could get through city gates. Expected a boche raid but clouds came over and spoiled it. Weird walk through city. Still about half sick and rheumatism giving me fits. From our station went over to French and British seaplane stations. Then went out to R.N.A.S. bombing station near front. Bitter cold. The Handley Pages look like battleships, Quite a little artillery actions today. Drove back through Dunkirk. Is a sad deserted looking place. There is scarcely a whole pane of glass in the city and it is hard to find a building which has not been scarred or damaged by bombs. On a recent raid 1 bomb killed 50 people. I doubt if we have a raid tonight. Too many clouds. Walked home alone tonight. Weird feeling walking through city without a single light or sign of life in it. Rheumatism hurting me so am going to bed now. Dunkirk, France. Dover and London, Eng. Went to dock to get on destroyer for Dover. My destroyer had not arrived. Finally found the H.M.S, BROKE that was going over and the skipper, Cdr. Ramsay said I could come along. BROKE has a famous record in the war. Channel very rough. Saw line of nets across channel and fired some shots at something we believed was a submarine. Thought I saw another sub but it turned out to be a dead man floating in the water. Arrived Dover at 12. Cliffs are very pretty. Went up town and sent cab back for my luggage. Was so long coming thought I would miss the train. It finally arrived and I found they had dropped my trunk overboard and absolutely ruined everything in it. Awful calamity as all my good things were in it. Arrived London 7 p.m. and went to Savoy. Worked until 11 o'clock trying to save the things that were in my trunk. Hopeless job as they must have been in salt water some time. Am dead tired and half sick. Want my little wife the worst way. Met in lobby. He is just over and on his way to Paris. We went to the Embassy and took lunch with Edwards. Edwards had dinner with as at Savoy. was getting drunk with some British officers. Edwards and I got disgusted and decided to go to bed. The last I saw of _ he had a loudly dressed and painted woman and was pretty drunk. Still feel very bum. Went to see about steamer home. Found St. Louis sails on 3rd and engaged passage. Made me feel awfully good. Went to Embassy to get orders to English schools and transportation home. Took me all day to do it. At night Edwards, Bastedo and I had dinner at Princes. All of us did not feel like waiting for the New Year so went to bed at 10. New Year's Eve was extremely quiet in London. At the Savoy there seemed to be some noise and drinking. left for Paris this morning. Left London 9 a.m. Arrived Eastchurch at R.N.A.S. School of Aerial Fire 11 a.m. Is a very large, interesting and Well managed school. Took lunch with the Commandant Capt. Steele who was captured and escaped from Germany. Spent the day going over the methods used. It is the coldest kind of cold and goes right through you like a knife. Arrived London 7:30 p.m. Cold and rheumatism very bad and am going straight to bed. Certainly am homesick for my little wife. Arrived R.F.C. School of Aerial Fire at Hythe at 11 a.m. Spent morning looking over ground school. After lunch drove to flying field, looked it over and then had lots of fun shooting at targets from the air and also fighting another machine in the air with the camera gun. Enjoyed it except for the cold. Arrived London at 7 p.m. Feeling so bad decided to try to forget it at a show, Went to see "Cheep." Was fairly good, Am worried about my cold and my kidney stone feels uncomfortable. Wish I had Josephine here to take care of me. It is funny I don't get any more letters. Wonder where they are. Hope she is getting mine regularly because I don't want the sweet little thing to worry. No one knows how glad I will be to get back to her. Steamer postponed until tomorrow. Spent day trying to buy something to take home. It is foolish as everything is higher than in New York and I have no room in my baggage. Gave up the idea. Liverpool and S.S. "St. Louis"
Left London 9:15 and arrived Liverpool 1:30. Went directly on board St. Louis. At last I am on way home and it certainly feels good. Steamer did not sail on account of subs outside. The Leviathian (the old Vaterland) is here and the subs are probably waiting for her. Woke up to find the ship still at Liverpool. We have been anchored here all day. Do not know if we sail during the night or not. Am anxious to get started. Are holding ship in port because subs are very active outside. one was just off the bar this morning. We have about 200 passengers on board. About dark we got permission to sail and sailed immediately. I am going to sleep with part of my clothes on. Woke up this morning to find the ship entering the harbor of Belfast, Ireland. We received a wireless that there were too many subs north of Ireland and ordering us to return to Belfast. Don't know how long we will have to stay here. Maybe several days, worse luck. When I woke we were steaming out of Belfast. We kept very close to the Irish coast which is very rugged and wild. In afternoon passed a large convoy coming in. It started blowing a gale this afternoon with the heaviest snow storm I ever saw. It continued to get worse and by dark it was breaking all over the ship. Before dinner 1 of the gun crew was washed overboard. We could not even try to pick him up. Coming from the smoking room my glasses blew off and when I leaned over to try to pick them up a sea came over and came near taking me overboard. I hate to lose the glasses. This is much worse than the storm we had coming over even. Slept hardly at all last night. Ship rolling so could hardly stay in bunk and every few minutes my trunk would get loose and slide around the stateroom making an awful racket. Spent most of night trying to keep it from smashing everything in the room. No one allowed on deck all morning. Smoothed down a little about noon, though it is still rough. The rough gales have been the best kind of protection against subs. If one had hit us we could not have even lowered a boat. Tonight we are nearly out of the danger zone, thank goodness. Hope will get a good nights sleep. Need it. Weather has been smooth and fine all day. We are in Gulf stream and although we are in the latitude of Labrador in winter, it is warm enough to go without an overcoat. worked part of the day. Am 1 day nearer my little wife thank God. Hope she can meet me in New York. Blew up again today and the old ship is rolling around so you have to hold on. Worked part of day. I figure we can't reach New York until Tuesday morning. That seems an age. Hope my little wife can meet me but won't be surprised if she does not, One day nearer to her anyway. It has continued rough all day and the old ship is rolling and pitching considerably. I tried to write my notebook part of the day but had poor luck. We made 405 miles the last 24 hours which is that much nearer home and Josephine. I wonder if she will be able to come to New York to meet me. Have decided not to be disappointed if she does not. Weather has been very rough all day. This afternoon the sea was so high we had to slow down to 9 knots. Made only 360 miles in 24 hours. Have headache and will turn in early. It looks like this voyage will never end. Too rough to write.